Semiconductors are a crucial element in modern electronics, making up an important part of many commonly used electronic devices, such as mobile phones, tablets, PCs, radios, and more - essentially all modern devices that many of us have become so highly dependent on in everyday life. As one might expect due to their central importance, the semiconductor industry is an extensive and competitive industry. In 2015, global sales exceeded 335 billion U.S. dollars. While revenue in regions such as Japan, Europe and the Americas is expected to show signs of leveling out, an increase is expected inthe Asia-Pacific region. Some of the biggest names within the semiconductor industry include: Intel, Samsung Electronics, Qualcomm, Texas Instruments, Toshiba and SK Hynix. 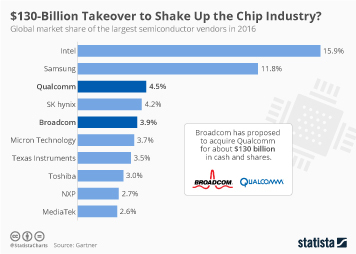 Over previous years, U.S. company Intel has consistently held the greatest share of the global semiconductor market. With respect to revenue, the company generated a total of more than 51 billion U.S. dollars through sales of semiconductors in 2015 alone. In addition to generating significant profits through the sale of smartphones and other products, Samsung also generated a sizeable chunk of their revenue from semiconductor sales and claims second place within the global market.